Establishing a balanced pond ecosystem is the easiest way to ensure healthy fish, which are in turn an important part of that balance. Caring for them can be easy! Many people enjoy feeding their fish and some can be trained to eat right from your hand! Only give them what they can eat in a few minutes and remove any excess food to prevent decay in the water. 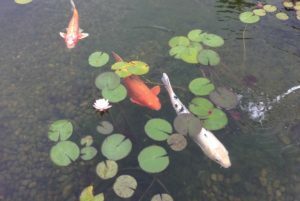 Some pond owners feed the fish once or twice a week. Some people enjoy feeding them daily, but remember that overfeeding can overload the filtration system with excess waste. The fish will naturally eat algae from the pond so there isn’t a true need to feed them daily. We recommend feeding them once a week. 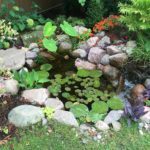 If water needs to be changed or added to the pond make sure to add a detoxifier if it is more than 20% of the total volume. It removes and detoxifies chlorine from the water. Chlorine can burn the gills of the fish, so make sure not to add large amounts of regular tap water to your system without detoxifier. 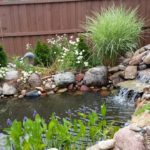 Make sure your pond has a running waterfall and aerators where the water has little flow. This provides the needed oxygen to fish and plants, keeping troublesome algae away. Raccoons and heron can be a predators of your lovely pond fish! Adding a fish cave, a scarecrow (automatic sprinkler head activate by movement), and even a net over the pond can deter predators. While they are often not a problem, if you find yourself with unwanted guests you'll want to get rid of them fast! How many fish can be in this pond? Over stocking fish creates an imbalance in the pond’s ecosystem and can be detrimental to the health of your fish. A 7 inch koi needs 74.8 gallons of water - or 10 cubic ft. Generally, goldfish can be kept in closer proximity. They are going to go almost dormant during the winter so do not feed them once the water is lower than 50 degrees. 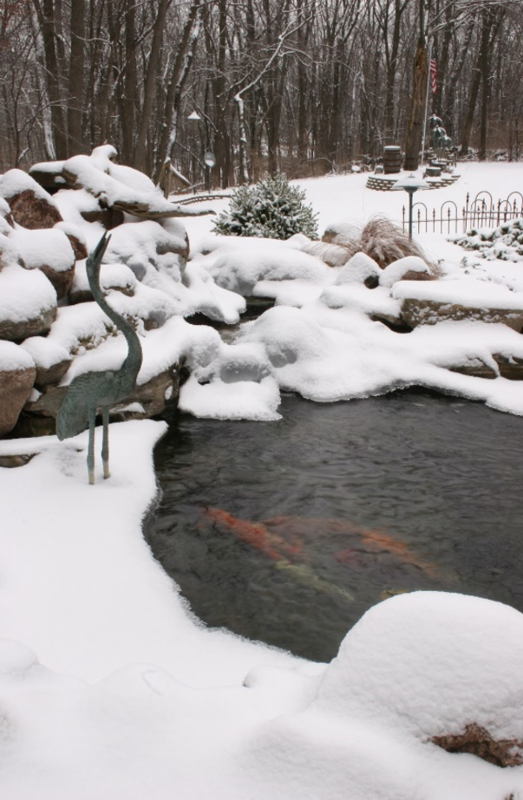 While it is ok if the pond is partially frozen over, they still need at least a small hole left open so that fish gases can escape. A floating deicer is great way to accomplish this. They also need oxygen in the winter so we advise running the waterfalls all winter long and even adding an aerator. If you need to add water to the pond in the winter, make sure you add detoxifier at the same time to prevent burns from chlorine. Fish are also sensitive to clanging on the frozen ice of the pond. Imagine if you were taking a nap and suddenly heard loud banging and cracking! If you need to break the ice, gently push a stick in or even poor boiling water on a thin spot. Fruits and vegetables for fish? A great way to ensure that your fish are receiving all the vitamins and minerals they need is to feed them fresh fruit now and then. Halves or quarters of orange or lemon are an excellent source of vitamin C. Make sure to wash them well first so that no pesticides are introduced to you pond. Fish will nibble at the pulp and you can remove the skin later. A good way to introduce a new food is to give just a little bit of it along with the regular food you give them. They can be finicky and not all fish like the same things. One fun thing to do is to cut out the center of a watermelon in a one inch section. Make sure to remove the seeds. When you put it in it will float and the fish enjoy pushing it around the pond and having a little treat. Make sure not to put it in an area that it will immediately go into the skimmer! Greens for fish, such as peas or zucchini, can be good for them in moderation. Once monthly is a good start. They’ll nibble the peas directly but be sure to remove any that are uneaten. Peel and slice a zucchini lengthwise (removing the seeds) it will float and the fish will enjoy nibbling at it. 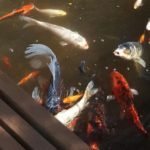 Whether fish are just being transferred from a holding tank back to the pond after a cleanout or from one pond to another, there are several things that need to be considered for the safety of the fish. Bag fish and let them float in the the new water for 15 to 30 minutes to allow temperature to even out. Every few minutes give a splash into the bag of the new water. This will help the temperature come to equality as well as slowly change the pH in the water they are in. When the water temperature is the same or under 5 degrees you can safely transfer the fish. Fill up the new pond and let it sit for 2 days to a week. This will allow the air temperature to bring the pond up to normal temperatures. It will also allow chlorine to evaporate and give you a change to add beneficial bacteria to the system several times before the fish even get into it, establishing the eco system. When adding new fish to your existing pond population, isolating new fish in a quarantine tank can prevent disaster. Setting up a holding portable pond allows the fish to be observed for parasites, bacteria infections, or fungus. It can provide opportunity to feed the new fish medicated fish foods if it needed without exposing existing fish to anything harmful. Quarantine can be from 15 days to several weeks. When quarantining fish make sure the tank is not sitting in the sun! A small tank can heat up too quickly. That being said, if you are not a koi enthusiast you may be wondering if you have to do this. You might not have a portable pond available with aerators. Most of our customers inspect new fish and add them right in after safe transferring but we just want to be clear that there is always a risk when adding new fish.